Ride and Read! NEWS by Madness Photography - Onno "Berserk" Wieringa: GARAGE-Girls Ultimate Biker Makeover teams up with Avon Tires! 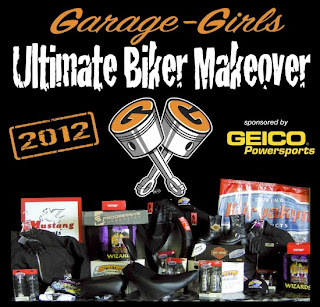 GARAGE-Girls Ultimate Biker Makeover teams up with Avon Tires! Are you still sporting the same riding gear you bought back in 1997? Is your bike lacking a few cool components to finally make it your own? If this describes you, then you MUST ENTER NOW for the GARAGE-Girls Ultimate Biker Makeover! You must be 18 years of age or older to participate and a resident of the United States. No purchase necessary. See full Official Rules and Regulations for details. This contest is open to anyone that feels he or she needs a Biker Makeover. Maybe your still wearing the same leather jacket from 15 years ago, maybe your riding boots have no soles left, maybe luck hasn’t been on your side for some time and this could really help boost your life! • Overall creativity, The judges will be looking for cool, innovative images and words that bring your story to life and demonstrate how a Biker Makeover will benefit you. Employees at Garage-Girls carefully review each contest entry, each judge will make their selection of 2 entries. All picks will then be sent back to all judges for a final vote, the top 4 will be placed on this website for online voting from the public. The 1 with the highest number of votes will be determined the winner of the Garage-Girls Ultimate Biker Makeover.